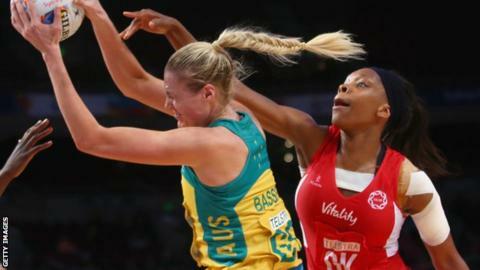 England fell to their first defeat of the Netball World Cup as they were beaten 51-41 by holders Australia. Tracey Neville's side overcame Jamaica, Samoa and Scotland to progress to the second group stage as Pool B winners. The Roses were only five goals down at half-time in Tuesday's game in Sydney, but 10-time winners Australia finished well to make sure of the victory. England return to action on Wednesday against Wales, who lost 68-40 to South Africa earlier in the day. The top two teams from each second-round pool progress to the semi-finals, which will be held on Saturday. In the opposing pool, New Zealand beat Jamaica 55-48 while Malawi won 59-53 against Uganda. Scotland drop into the second tier of eight, after finishing the third in their preliminary pool, and started their second round of fixtures with a 37-34 win over Barbados.